How can I set wire transfers as a payment method? HOME > SETUP AREA > How can I set wire transfers as a payment method? STEP 2: Click on NEW and select WIRE TRANSFER from the drop-down list. STEP 3: Flag the option ACTIVE in order to make this payment method available on your booking engine. 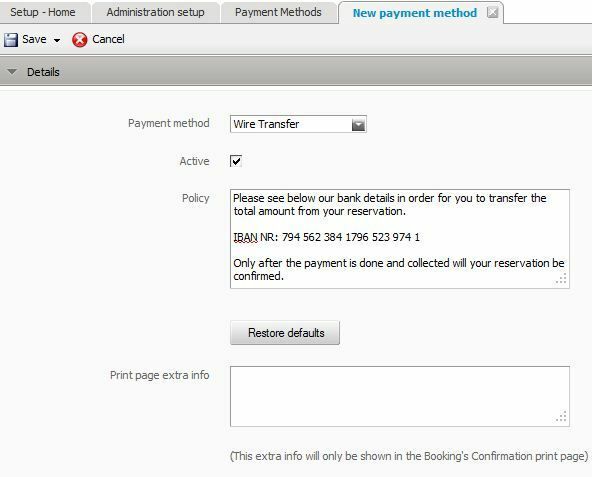 STEP 4: Please add your bank details on the POLICY field and make sure you specify that the reservation will only be confirmed after payment is received. NOTE: You can also add any other information you want to be displayed on the Confirmation Print Page, just by adding the relevant information to the PRINT PAGE EXTRA INFO field. The wire transfer policy information will be displayed as a pop-up message as soon as your client selects this option on your booking engine. In order for the client to complete the reservation, they will need to click on OK, go through the reCAPTCHA process and then OK again. You will need now to check whether the relevant payment has been received on your bank account so that you can then confirm the relevant reservation. For more details on how to confirm your reservation please see relevant e-commerce card here. This payment method involves a payment and reservation confirmation that are external procedures. 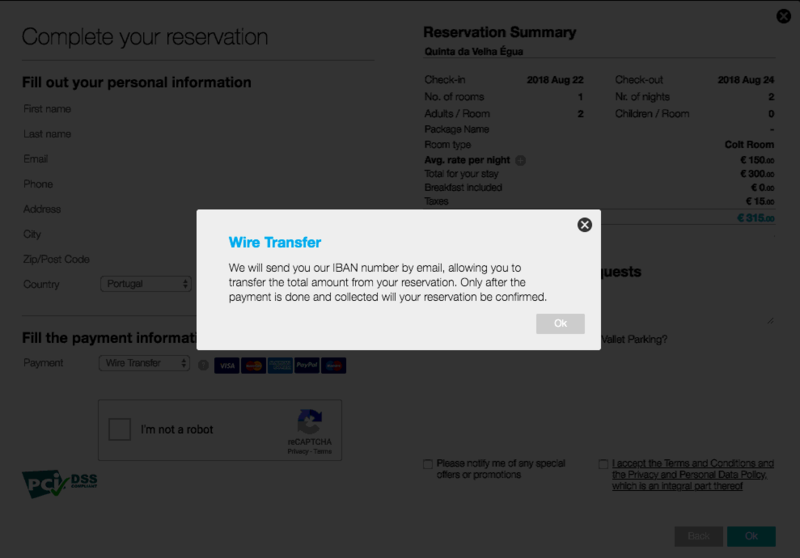 As the message says, the hotel must manually send the bank details to the guest, check the reception of the payment and then alert the client that the reservation is confirmed. This does not happen automatically within the application.